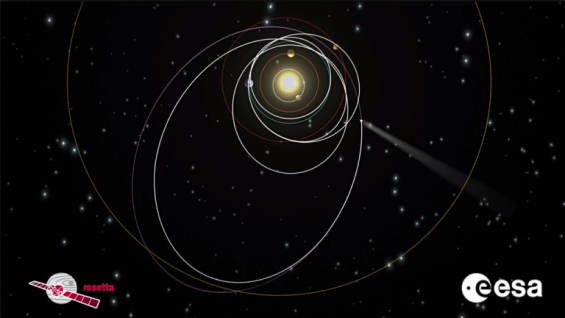 Orbit: En route to Comet 67P/Churyumov-Gerasimenko, Rosetta completed a complex trajectory that included four gravity assist manoeuvres (3 × Earth, 1 × Mars). The spacecraft arrived at the comet on 6 August 2014. Since then, the spacecraft has been orbiting the comet. It will accompany the comet on its journey around the Sun. Global characterisation of asteroids, including determination of dynamic properties, surface morphology and composition. The International Rosetta Mission was approved in November 1993 by ESA's Science Programme Committee as the Planetary Cornerstone Mission in ESA's long-term space science programme. The mission was originally set for a rendezvous with Comet 46 P/Wirtanen. After postponement of the original launch a new target was set: Comet 67P/Churyumov-Gerasimenko. During its 10 year journey towards the comet, the spacecraft has passed by two asteroids: 2867 Steins (in 2008) and 21 Lutetia (in 2010). Rosetta arrived at the comet on 6 August 2014 and following deployment of the lander, Philae, on 12 November, the orbiter is accompanying the comet through perihelion and back to deep space until the mission ends in September 2016. Rosetta's main objective is to rendezvous with, and enter orbit around, comet 67P/Churyumov-Gerasimenko and to perform observations of the comet's nucleus and coma. During the period that Rosetta orbits the comet, 67P/Churyumov-Gerasimenko will reach perihelion (the closest point to the Sun in its orbit), allowing for the resulting increase in activity to be measured. On 12 November, a lander named Philae was deployed and made the first soft landing on a comet. Rosetta's lander Philae is named after an island in the Nile river, where archaeologists found an inscription on an obelisk that confirmed their interpretation of the Rosetta Stone texts. The Rosetta design is based on a box-type central structure, 2.8 m × 2.1 m × 2.0 m, on which all subsystems and payload equipment are mounted. Two solar panels, with a combined area of 64 m², each stretch out to 14 m in length. The total span from tip to tip is 32 m. The Philae lander, measuring about 1 m × 1 m × 1 m (before deployment of its landing gear), is attached to the spacecraft side opposite to the side that carries the 2.2m diameter steerable high-gain antenna. The Rosetta orbiter (left) carries an instrument suite of 11 science instrument packages along with the Philae lander (right) which carries 10 science instrument packages. Credit: ESA/ATG medialab. This animation tracks Rosetta's journey through the Solar System, using gravity slingshots from Earth and Mars to reach its final destination: comet 67P/Churyumov-Gerasimenko. Copyright: ESA. Click here for video details.